Media in China continue to urge public support for victims of the Sichuan earthquake, while public concerns over corruption are hitting donations from Hong Kong. 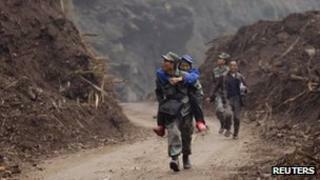 Massive relief operations for the earthquake in Sichuan's Ya'an City have been warmly praised by media in the mainland. However there are grave concerns over a chronic shortage of aid for victims, and for the over 3,000 aftershocks recorded since Saturday. Beijing Times says more than 90% of buildings are in danger of collapsing and more than 100,000 people in Ya'an's Tianquan county have no water, food or tents. Clashes broke out between police and hungry villagers frustrated at only receiving bottles of water and no food in Chaoyang in Lushan county, Oriental Daily News reports. Experts are also debating the cause of the earthquake, notes Taipei's Central News Agency. Mainland geologist Yang Yong says the controversial Three Georges hydropower project on the Yangtze River may have triggered the earthquake. Fan Xiao, chief engineer at the Sichuan Bureau of Geology and Mineral Resources, told Global Times on Monday that the huge pressure of large reservoirs built on the fault line may have induced the Ya'an earthquakes and the more powerful Wenchuan earthquake in 2008. Geologists warn that the two earthquakes occurred on the same fault line, which may signal hyperactive seismic activity in the region, South China Morning Post reports. China Youth Daily says the country must learn from Japan's earthquake-resistant building designs after almost all the buildings in Baoxing county in Ya'an, including newer earthquake-proof houses, were badly damaged in the quake. Many people are donating funds to online charity platforms on microblog services and other non-governmental channels amid lingering scepticism over the Red Cross Society of China, which has been dogged by scandals in recent years, Global Times reports. Beijing News commentator Wei Wei welcomes an emergency notice by the Ministry of Civil Affairs calling for transparency and social supervision over charity donations, but says far more needs to be done to allay public fears that funds may be embezzled. In Hong Kong, a media debate has broken out over an online civic campaign to try to block earthquake donations in case corrupt officials pocket funds, South China Morning Post reports. Oriental Daily News blames corruption and a lack of transparency in the mainland for a "marked cooling down" of public enthusiasm in Hong Kong for donating funds compared with the Wenchuan earthquake five years ago. Apple Daily calls on the Hong Kong government to transfer donations earmarked for the Sichuan government to non-government organisations instead if Sichuan authorities refuse to accept external supervision on how relief funds are used. The Beijing-backed Ta Kung Pao accuses Apple of hyping up charity fund embezzlement scandals and scaring off the public from making donations. Some mainland internet users are even suspicious over the official death toll of less than 200 people from the earthquake after a hospital in Lushan county reportedly recorded more than 300 deaths, Oriental Daily News notes. In other domestic news, the World Health Organization is watching out for mutations and possible human-to-human transmission of the new H7N9 bird flu strain after two family cluster cases - a father-and-son cluster and a husband-and-wife cluster - were detected in Shanghai, China Daily reports. Yuan Ling, reporter for Chinese magazine Lens, is challenging the Liaoning government's rebuttal of his expose on alleged torture at the Maisanjia women's labour camp, says South China Morning Post. Authorities condemned the Lens report as "malicious attack rhetoric characteristic of Falun Gong", an outlawed spiritual movement. Finally, Zhang Aihua, an industrial park management official from Taizhou in Jiangsu, is under investigation for kneeling on a dinner table and begging forgiveness from outraged residents through a loudspeaker after being caught enjoying a lavish dinner with his colleagues last Friday, The Beijing News says. Each table at the banquet reportedly cost 2,715 yuan ($440, £288) each, and included expensive treats such as poisonous puffer fish, high-end alcohol and cigarettes, the newspaper adds. In recent weeks, some officials have been feasting secretly at the public's expense after the government introduced curbs last December on extravagant official receptions.